The Folkestone Royal ark Mariners Lodge 380 had cause for celebration at their installation meeting held on Wednesday 25th May in Sandgate. The installation of the new Worshipful Commander David Grant by the outgoing commander W.Bro Peter Water was performed to a very high standard and enjoyed by everyone. 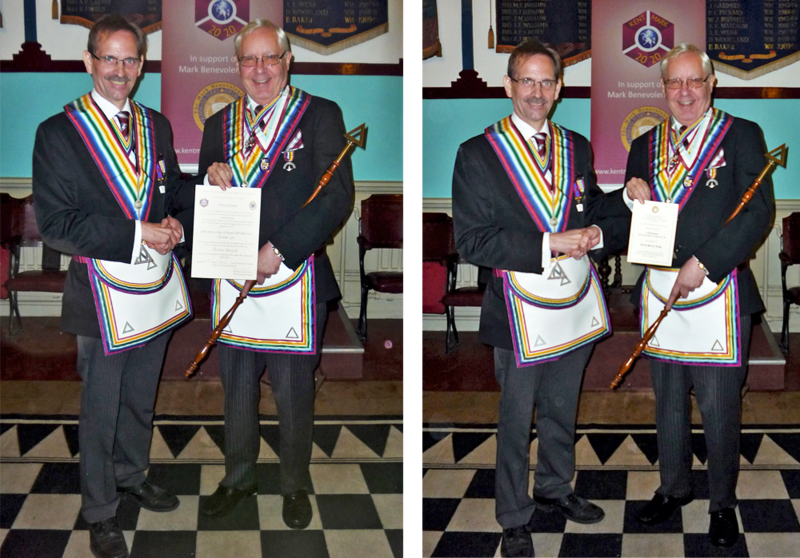 To complete the celebrations of the evening W.Bro Ian Gallehawk, the Provincial Charity Steward was then delighted to present a Bronze award to mark the progress the lodge had made in supporting the a 2020 Festival, followed by another presentation to the W Cdr to acknowledge that the lodge had also achieved the Grand Patron status awarded by the MBF. W.Bro Ian then thanked the brethren of lodge for the tremendous efforts they were making to support the 2020 festival and wished them luck in attaining their Silver and possibly Platinum awards before the end of the festival. The first photo (top) is a picture of all the brethren of the lodge, the second is of the W.Cdr W.Bro David Grant being presented with the Bronze Festival award by W.Bro Ian Gallehawk the Provincial Charity Steward and the third is of the W.Cdr W.Bro David Grant being presented with the MBF Gold Patron award by W.Bro Ian Gallehawk the Provincial Charity Steward.